Mustard Powder is a spice made of dried and ground mustard seeds. It is usually used to sprinkle on pretzels, chips, and more. Mustard Powder is usually used for cooking with dry ingredients. It can also be added to liquids, such as vinegar, to create prepared mustard. When first milled or ground, mustard flour looks and tastes as bland and white as cornstarch. Ground mustard has no aroma or flavor until liquid is added. In powdered form, ground turmeric or yellow saffron is added to mustard flour to provide a yellow color and for added flavor - to produce mustard powder. Most mustard powders are a combination of white and brown crushed- ground- milled mustard seeds. Choosing: Check for color inconsistency. If its not bright yellow, don't buy it. 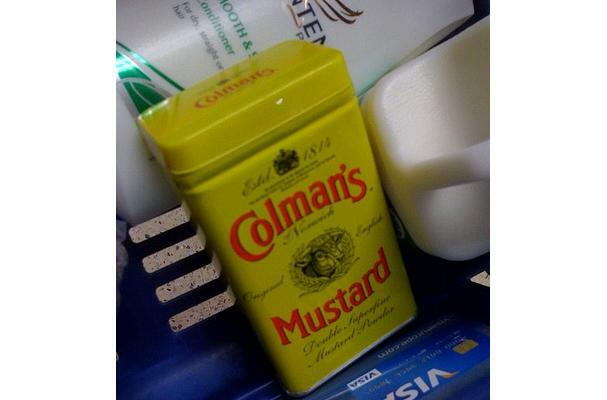 Mustard powder takes time to oxidized but once it did, color changes may occur. Also check for algae and other single cell organism build up. Buying: Dry mustard is available in the spice section of nearly every supermarket. Powdered mustard is usually available in small sprinkle-pour spice containers. Powdered mustard can be used anywhere regular mustard would be used, such as in mayonnaise, combined with oil and vinegar as a marinade for pork, and in a mustard sauce and salad dressing. It is also used to flavor grilled meat and fish. Store in an airtight container in a cool dark cabinet. English culinary folklore suggests that mustard flour was invented in 1720 by a Mrs. Clements of Durham, England after she successfully developed a milling process. In subsequent years, Mrs. Durham commercialized her invention as "Durham mustard" - a "hot product" and a foretaste of worldwide demand which currently exceeds 400 million pounds annually. History: The mustard plant probably originated in the Mediterranean region, though different varieties are found in ancient use (possible origin) in most areas of Europe and in China. Today, mustard is cultivated worldwide. Archaelogical evidence supports the use of mustard in ancient Rome and its frontier colonies, such as Gaul. Large quantities of spices - mustard, dill, fennel, coriander, and black cumin - have been discovered in recent digs along the Via Decumana of ancient Roman London, circa 60 AD. Mustard seed is mentioned in Matthew 13:31 of the New Testament, attesting to the familiarity of 1st century Hebrews with the appearance of mustard seeds.